Energy – IEC Integrated Engineering Consultants, Inc.
Airrail Center Frankfurt is located at the most important traffic hub in Europe, connecting to the second largest airport in Europe. When completed in spring 2011, it will have a daily occupant load of 7,000 employees, and 3,000 to 4,000 visitors. 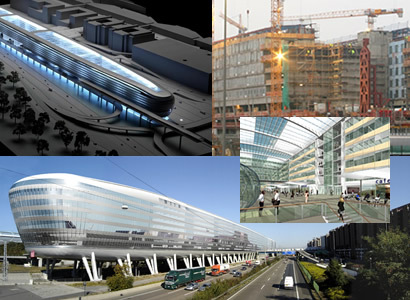 Airrail is one of the largest commercial properties in Europe. The Center is comprised of two hotels that are consists of 366,000 sq. ft. and 582 rooms, a medical center, retails shops, and office space along a glass cover 65,000 sq. ft atrium.